The Military Team at Liz Moore and Associates, with help from other agents and clients, recently sent over 150 boxes of Girl Scout cookies to troops serving overseas. This is something the team does every year to say "thank you" to the men and women that fight for our freedom. 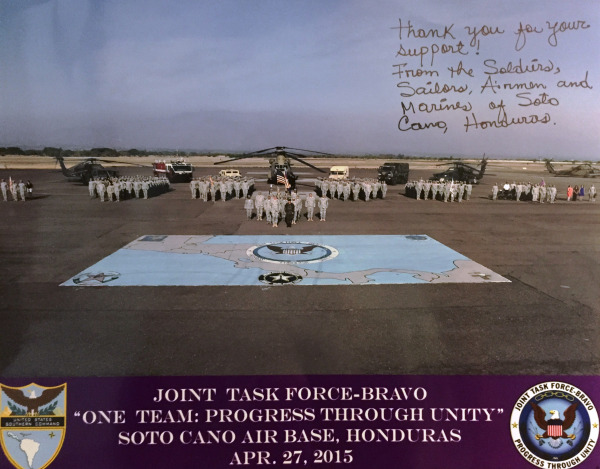 The Military Team received a letter of thanks, along with a photo, from Joint Task Force-Bravo, Soto Cano, Honduras. "It's simple gestures like what you guys did that have an astronomical effect on service members that are deployed or away from friends and family for a while. I can't relay the feeling you get when you get a box or piece of mail and get to escape from where you're at, if only for a minute. Having been deployed four times, I still get butterflies when it's time to check the mail," one solider said in an excerpt from the letter. Thank you to everyone who donated to this cause! For more information on ways you can help, email us at pcs@lizmoore.com or click below.